This is probably my favorite ribbon (right now anyway). There are so many things that you can do with it. This was a neat way to use the ribbon on a card front since it's wider than our usually ribbons. There are a few steps to this card; however each of them is simple. Start with scraps of Riding Hood Red, Close to Cocoa and Pink Pirouette and stamp the words friend to friend on each scrap. Punch them out using the Word Window Punch and punch a 1/16" hole in one end of each word window. Using the Elastic Silver Cord and the beads from the Pretties Kit, thread the word windows on the cord. Next, take your Pink Pirouette Ribbon and tie it in a knot. Thread the silver cord through the knot and tie. Layer your Candy Lane DSP onto your layer of Close to Cocoa cardstock. Using Snail Adhesive on the back of the Close to Cocoa, attach each end of the ribbon to the back and mount onto your Riding Hood Red card. Finally, use Riding Hood Red ink to stamp the three hearts onto the two different Pink Pirouette designs from the Candy Lane DSP. Punch out using the Heart to Heart Punch and be amazed at how wonderfully they line up!!! 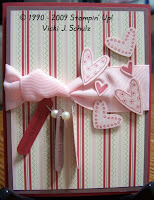 Attach your hearts to your card using dimensionals for the larger hearts and the Tombow Multi-Purpose Glue for the small hearts. Enjoy your creation!! It's so much fun.